Not widely seen in cultivation, Campanula vidalii (syn. 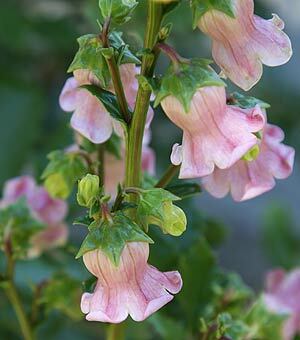 Azorina vidalii) is a lovely species with either white or pink waxy bell shaped flowers in summer months. It takes a year or two to flower, however when it does you will be rewarded with masses of flowers on tall spikes. The foliage is thick and glossy, it seems to be almost succulent like and is originally from the Azores and is also known as the ‘Azores Bellflower’, Madeiran Bellflower and Azorina vidalii. Howevever it is a member of the campanula family. As the flower spikes form Campanula vidalii will reach nearly .7m in height in good conditions. A very easy plant to grow as long as you do not fuss about it. It does require a humus rich free draining soil and can be planted in the cottage garden where it will self seed. The foliage looks good and once it settles in it will provide you with masses of flowers year after year. This is a perennial, but one that has a short life span. It will set viable seed which can be collected and germinated, left to self seed. Plants can take 3 – 4 years to flower from seed, so be patient.